Years and years ago, hundreds of thousands of Atlantic salmon made their epic migration from the oceans of Greenland to their natal rivers in Maine. Now it would be a privilege to see even a few of these powerful creatures. While a number of threats contributed to the decline of this endangered fish, one of the biggest obstacles to the recovery of Atlantic salmon is blocked access to their freshwater spawning habitat. Steve Koenig of Eastport, Maine, wanted to do something about it. 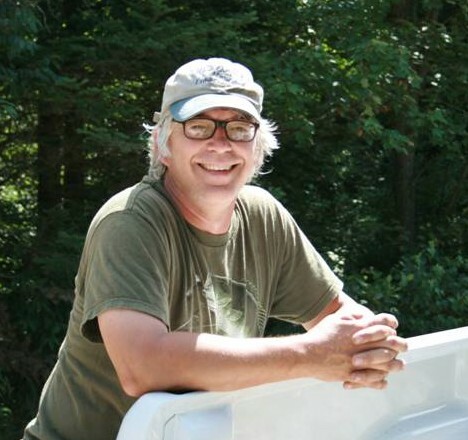 In 2001, he became the executive director of SHARE (Salmon Habitat and River Enhancement) in Downeast Maine, and since 2005, his work has improved 85 miles of salmon habitat. What is the problem you are helping to solve, regarding Atlantic salmon and other native fish? (Steve) SHARE draws attention to the many problems that poorly designed road-stream crossings have on the recovery of endangered Atlantic salmon and other native fish species. When culverts are the wrong size or in the wrong place, they can be a barrier for fish and water movement, affecting habitat and water quality. 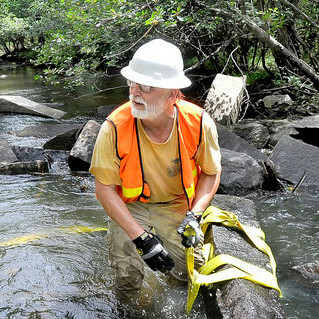 Since 2005, SHARE has either removed or replaced 159 culverts in streams that now allow unobstructed fish passage and natural stream functions. What motivates you to work for endangered Atlantic salmon? The sole mission of SHARE, which is a non-profit and was created in 1994, is to support habitat restoration. Given the mission of SHARE, early on I was able to see the need for a program to engage in active on-the-ground habitat restoration. Although there are multiple agencies and groups associated with salmon restoration, no one was actively involved with habitat restoration on the Downeast Maine rivers. Internally we developed that program within SHARE. Personally, I receive a great deal of satisfaction when we can take on a site and address the habitat issue. With road crossings, it is a simple matter of allowing the stream to flow through the crossing in its natural state. By restoring the natural stream flow, fish passage and habitat improvement become a natural function of restored stream processes. How does it go down – what work is done to benefit Atlantic salmon? SHARE’s accomplishments are the direct result of tapping into the capacity of its member stakeholders – from landowners where these habitat issues are found to state and federal resource agencies. Together, they help us with technical assistance and funding support. Quite often we work with high school and college students to plant trees and perform additional minor channel modification. We also work on remnant log drive dams and large wood additions. Once sites are identified, we work with volunteers from SHARE’s stakeholder groups to complete the projects using hand tools and hand labor. It may seem like a lot of work (and it is), but it is very gratifying particularly at the end of the day when you can see what you have accomplished. Steve’s background is in aquatic ecology. He grew up in Michigan sailing on Lake Huron and paddling many of the remote smaller rivers. Photo courtesy of SHARE. Who do you work with? We work with large landowners, land trusts, Maine Department of Marine Resources, Maine Forest Service, Maine Department of Environmental Protection, Maine Department of Inland Fisheries and Wildlife, National Oceanic and Atmospheric Administration, U.S. Fish and Wildlife Service, USDA-Natural Resources Conservation Service, Atlantic Salmon Federation, The Nature Conservancy, Audubon, University of Maine, and Washington Academy. What do you hope to result from your work? A few years ago, we were completing a number of good projects each year, but the task before us was simply enormous and daunting. Hope for Atlantic salmon restoration was best described as pretty low. At that time, my hope was to draw attention to habitat issues for salmon with the hope of gaining momentum. Some people suggested that while it may be to late for salmon, the work we are doing might benefit brook trout to the point that in 50 years they wouldn’t need to be listed. However, in 2009, SHARE received major funding from American Recovery and Reinvestment Act grants through NOAA and USFWS. We were able to complete over 100 road crossings in a concentrated area of the Machias River from 2009 to 2011. Those efforts demonstrated that as resources become available, we are on the right track and can work at a pace that is biologically significant for salmon restoration. My plan now is to continue to promote the positive outcomes we can achieve, for Atlantic salmon, brook trout, and for the watershed as a whole. We have the right mix of partners, clear objectives based on threat assessments, and the capacity to get things done. We simply need to address the age-old problem of identifying funding sources and aim capacity and resources at additional concentrated focus areas. Do you have a personal connection to Atlantic salmon or stream restoration? With Project SHARE, I am able to work in an outdoor setting on projects that few who are in the business of conservation business ever get the chance to experience. I am able to identify a threat, develop the solution, plan and then carry it out. The ultimate satisfaction comes at the end of the day, once the excavators and pumps are shut off, workers leave the site, and I am able to quietly sit and hear a stream that once again can flow naturally. It is a feeling that can’t really be described; it can only be experienced. 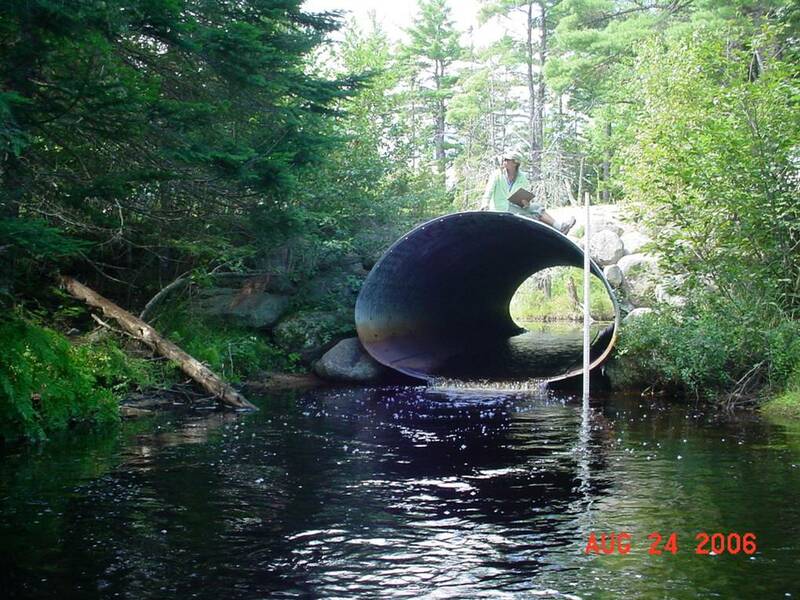 This entry was posted in Blog entries, Endangered Species, Partnerships and tagged atlantic salmon, downeast maine, eastport, endangered species, esa 40, fish habitat, fish passage, koenig, Maine, project share, recovery champion, salmon, share, steve koenig on May 17, 2013 by usfwsnortheastblog.